Lesotho’s services sector is the biggest contributor to national gross domestic product (GDP) and has great potential for generating sustainable growth and creating employment opportunities in the future. However, the relative performance of Lesotho’s services exports has been poor in comparison to the country’s total merchandise exports over the past two decades. Lesotho remains a net services importer. The Lesotho Services Policy Review provides an analysis of the current policy framework for the three sectors, identifies regulatory challenges and institutional weaknesses inhibiting sectoral development, and proposes policy options that could better respond to the country’s financial, health and tourism development objectives. Issues are reviewed that pertain to the strengthening of domestic supply capacity, the competitiveness of small and medium-sized enterprises, employment and poverty alleviation, and universal access to basic services. The potential impacts of services and services trade liberalization, and the prospective benefits of access to foreign markets, receive particular attention. Lesotho is completely encircled by South Africa, so making a visit to the fabled mountain kingdom was a big priority of mine when I knew I'd be nearby. The only question was how. Many options for visiting Lesotho exist, but several of them are logistically challenging. I could've traveled via the Sani Pass in South Africa's southern Drakensberg region. This would've allowed me to enjoy a cocktail at the Sani Chalet, which is arguably one of the World's Best Bars, at thousands of meters above sea level. The problem? Getting to the southern Drakensberg is difficult for backpackers, and Sani Pass treks are very expensive. Eighteen young rugby enthusiasts from the orphanage project, TY Academy, in Lesotho attended London Welsh's Premiership Rugby fixture against Sale Sharks on Sunday as guests of QBE, the business insurance specialist. QBE employee Chris Hart organised the trip to the Kassam Stadium on behalf of his local rugby club, Braintree RFC, who hosted the children from TY Academy. Braintree RFC worked with the Federation of Lesotho Rugby and touraid to give these boys a once in a lifetime trip to the UK and an opportunity to experience the joy of rugby. For the families involved in hosting them, it was an opportunity to learn first-hand about life in Lesotho. Summer in Lesotho is not entirely unlike summer in South Dakota. It is hot, even at 9 a.m., and the flies and mosquitoes are rampant. Without air conditioning, life shuts down in the afternoon as people retreat to thatched-roofed homes or shady trees until the sun starts to descend and it’s cool enough to socialize again. I suggest that in Sesotho when people resemble each other too much, I suggest we say: "Ba tšoana joalo ka libono!" Greg's book is true: it happened, and it depicts Lesotho as it is. I like the conversational and non-rambling style the book is written in. I haven't been able to put it down, and I am from Lesotho! There is language, terrain, people and personal experience touched upon. A book I'd recommend for anybody. Lesotho suffers from the third-highest rate of HIV infection in the world—almost one-quarter of the adult population is estimated to be HIV-positive. By some estimates, average life expectancy is less than 40 years. Lesotho’s steep mountains and harsh weather also restrict access to health services for many people. Many patients must walk an average of three to five hours over steep terrain to reach medical facilities. PIH/Lesotho (PIH/L), launched in 2006 at the invitation of Lesotho’s government and in consultation with the Clinton Health Access Initiative, works to improve the health of eight remote mountain communities, providing integrated services for maternal and child health, HIV, and tuberculosis, while managing the national program to treat multidrug-resistant tuberculosis (MDR-TB). The program brings health care to nearly 200,000 people. And to think I'm going to meet her when she comes to Paris to collect it! Lesotho will be joining the rest of the world in celebrating the World radio Day from 12th to 13th February, 2013. In a quest to encourage public, private and community broadcasters to come together and celebrate the day, UNESCO Windhoek Office in partnership with the Lesotho National Commission for UNESCO and in collaboration with the major media stakeholders, have organized two major events that will both be graced by the presence of the Minister of Communications, Science and Technology, Hon Ts’eliso Mokhosi. Lesotho recently completed a training session on the development of a National business continuity plan for the country, which was followed by the development of a draft plan. Present at the training were the International Health Regulations Manager Mr Khotso Mahomo, Chief Executive Disaster Management Authority „Mé Mojaki, StratMan Consultants, Government Officials and Representatives from non-governmental organizations. Dr. Mufunda, WHO Representative, opened the training session, which took place over 3 days. The several days which followed were used to develop the plan for Lesotho based on the five main working groups of the Disaster Management Authority– health and nutrition; water and sanitation; food security; logistics; and training. Today Partners In Health Co-founder Dr. Paul Farmer and Executive Director Ophelia Dahl celebrated the opening of Lesotho’s National TB Reference Lab, the first biosafety level 3 lab in the country and one of only two such state-of-the art tuberculosis testing facilities in southern Africa. The burden of tuberculosis in Lesotho, a small landlocked country surrounded by South Africa, is among the highest in the world. There are 633 new cases of TB per 100,000 people each year. Located in the capital city Maseru, the lab will allow cases of extensively drug-resistant tuberculosis (XDR-TB) to be identified without having to send samples outside of the country. Until now, identifying XDR-TB required samples to be shipped to labs in South Africa, a cumbersome and costly process that hindered care. Former Lesotho Trade Minister Propane Lebesa benefited from a government scheme that was intended to pay the rent of students studying in SA. The M&G has also learned that Lebesa was and still is the business partner of Bothata Mahlala, who is suspected of defrauding the scheme of millions of rands in 2009. Health Minister Dr Pinki Manamolela yesterday officially launched Lesotho's first cervical cancer treatment centre at the Senkatana Centre of Excellence. The move will see Lesotho saving about M12 million which was being spent on cancer treatment in South Africa every year. Lesotho sends 1 200 cancer patients to South Africa every year for treatment. Camara is pleased to announce a new deal with the Ministry of Education in Lesotho making the charity an approved partner. With this agreement, the Ministry recognises Camara as not only a hardware provider, but as experts in introducing Information and Communications Technologies in Education, thanks to the training programs included with Camara equipment. Over the next three years, Camara has plans to bring 3,700 PCs to the country, training 800 teachers and making 70,000 children digitally literate. 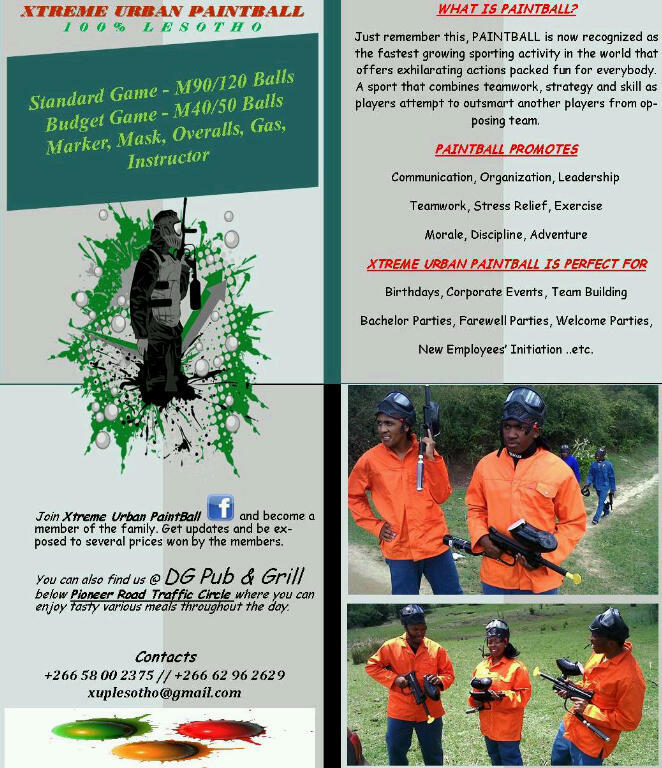 Dare to experience paintball in Maseru, Lesotho.We have games every weekend. For more information, call 58002375 or 62962629. • The 2011/12 maize harvest was more than 70 percent below the previous year’s below-average harvest, and maize meal prices are at least 30-40 percent above last year. • The Lesotho Vulnerability Assessment Committee estimated that about a third of the population of Lesotho might be at risk of food insecurity, particularly during the ongoing peak of the lean season between January and March. As a result, the government of Lesotho declared an Emergency Food Crisis in August 2012.